Today was a very interesting day full of learning. My classroom observation was scheduled for 12:45, so I had a morning to fill. Thankfully, I know a local who knew right where to take me and helped fill me in even more on some of the local science and history. 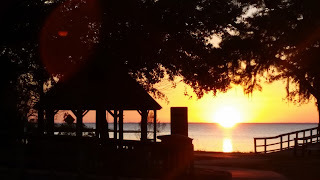 First, there is the Alabama Gulf Coast Zoo in Gulf Shores, Alabama. It has experienced evacuations and damage due to hurricanes through the years. They work hard to protect the animals and rebuild. The ultimate goal is to move the zoo to a larger facility. For now, it remains a smaller zoo that brings pride to locals. It has been featured on Animal Planet as "The Little Zoo That Could." Take a look at the zoo here. The beach in Gulf Shores, Alabama is beautiful. 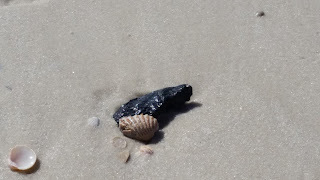 There is soft, sugar-like sand that feels wonderful between your toes and countless shells to observe and study. 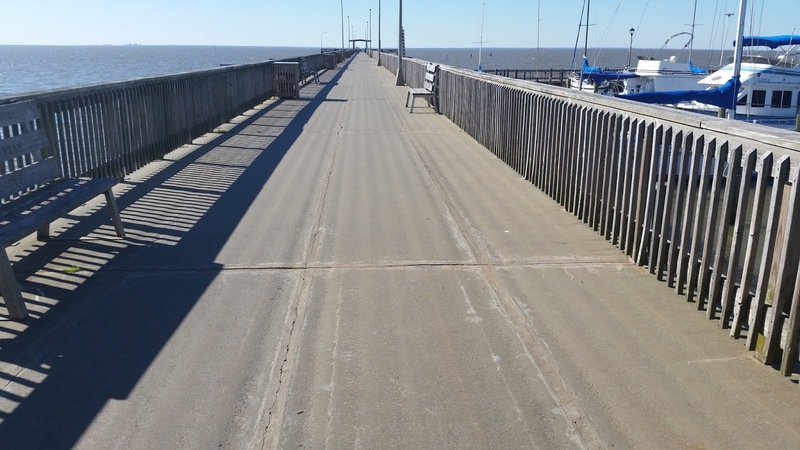 Did you know that you can see what's happening at the beach by viewing the webcams available? Take a look here. Today, I saw a jellyfish that had washed ashore. I learned of a harmful algal bloom in the Gulf that harmed the local sealife. 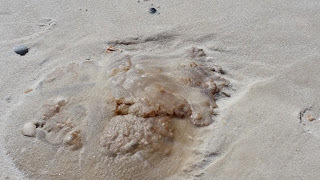 Then tonight, I discovered a place online where you can get updates on such algal blooms, known as Red Tide. NOAA has a page devoted to this for the Gulf of Mexico area here. I observed and photographed a tar ball, a small clump of tar that had washed ashore. These can both be caused by local issues as well as occur naturally. Large sand dollars (mostly broken into pieces) line the beach full of shells. Rules for the beach have become stricter, limiting what visitors can take with them onto the beach. This now includes umbrellas. Locals are generally pleased with this since one summer, groups left behind a trash-lined beach including broken umbrellas and such. this reminded me of two recent issues in California: the July 4 littering in Lake Tahoe and the winter littering of broken sleds and trash in the lower elevations of the Sierra Nevada Mountains. We owe it to ourselves, our children, the land, and our future to leave no trace. 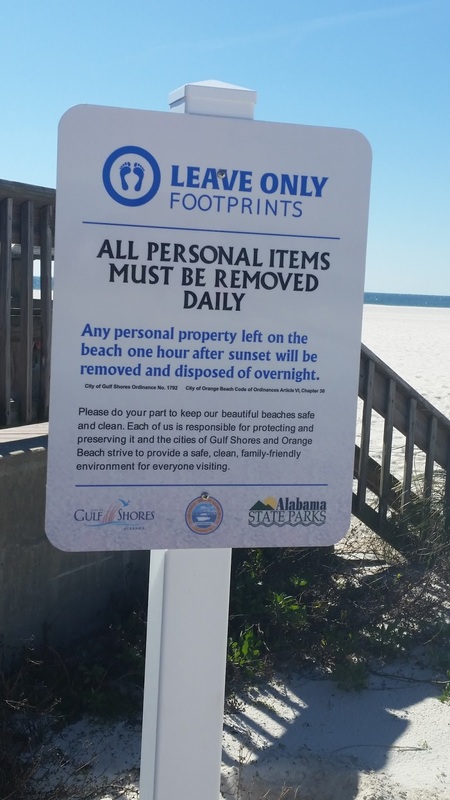 In this case, a sign promotes leaving only footprints. A suggestion: please don't feed the seagulls. I absorbed so much information and continue to process through it. Tonight, I set up class discussions in my Google Classroom for my seventh and eighth grade classes tomorrow. Both will look at two images, photographs I took in Gulf Shores today. One shows the tar ball and the other shows the Leave Only Footprints sign. The students will address questions posted with the images. 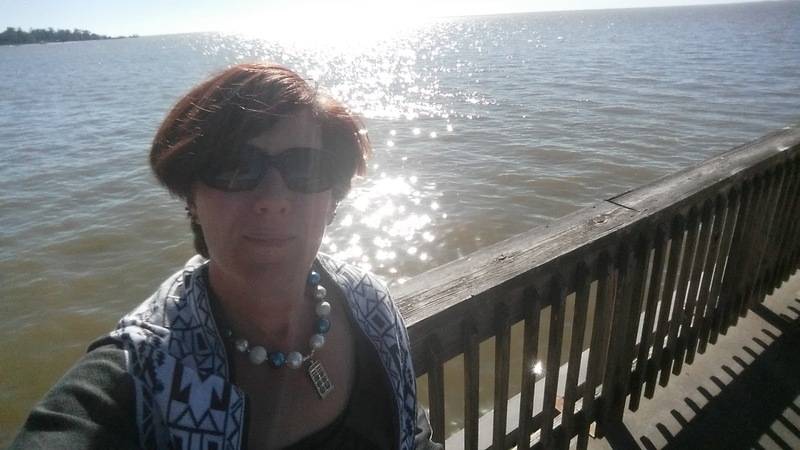 Teacher without walls brings the beach to her students for a chance to use their Google tools and learn something about this region thus breaking down the walls of the classroom if only for a moment. Now, I hope the Internet will cooperate. Today it caused some issues. I worked with my substitute, again long-distance, to try to work around it. I was thankful for her ability to think on her feet as well as for the chance to discuss the issue with her. Perhaps tomorrow will be better. If not, we will do what we do to work to make the best possible learning experience for the students. After a learning adventure along the sand of the Gulf, I traveled back to St. Patrick's Catholic School where I had a chance to meet with the computer instructor and share ideas. I also met their very lovely principal, Sister Margaret who has served as the school's principal since it opened in 1979. I observed a third grade class and their computer time exercises. I got to see Spelling City in action. They also used a variety of typing exercises and demonstrated some great abilities. After the class ended, I heard more about the school's participation in a local technology fair and observed the trophies lining a wall. These students are award winning technology students. Bravo! This opportunity also allowed me to share some of our school's journey with GAFE and its implementation this year. In asking questions and sharing ideas, I was able to speak to a couple of teachers, some students, a parent, and the principal. This school has much in which to take pride. It was such a pleasure to see what they are doing and the magic they are creating with their integration of technology. Here ends my Alabama adventure. Tomorrow, I am back on the road. I will use my journey back to the area closer to the airport and take in some more of the local science and history along the way. I plan to use the day wisely ahead of an early Saturday flight. There is so much processing yet to do and so many ideas to develop. Then lessons to write for next week and preparation to finalize for my upcoming presentations. 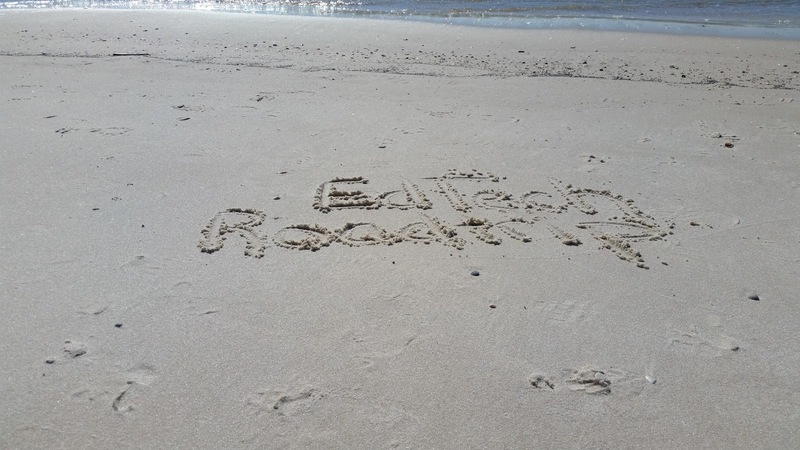 The EdTechRoadtrip continues and a week from Saturday, you can catch me presenting two sessions at ETC! 2016 in Stanislaus County. You may have heard the idea of a classroom without walls. In fact, I have worked hard through the years to break down the walls of the classroom. In some cases, that has meant stepping out with a camera, recording video, and bringing it back to my students. You can see more on this here. In other cases, that has meant stepping out on a day off from school to explore with students, such as our trip to Moaning Cavern last spring. This week, I have functioned as a teacher without walls. In October, I took the first step. I had to be off campus (and out of the area) for a couple of days. It was "personal leave," but I managed to be involved with the students learning even on that time away by using Google Classroom. 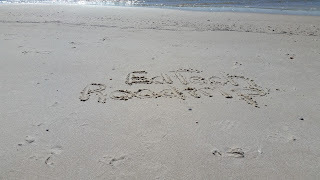 We just became a GAFE school this year and that was my first experience of working with my sub long distance and assisting in the facilitating of learning while away. Google Classroom was a fantastic tool for that. I use Google Classroom inside and outside of the walls of the classroom and it has helped me help the students in real time. This week, I took a couple of other steps. I have communicated with colleagues, parents, and students through email. This helped get my lesson plans where they needed to be, helped me make arrangements to work with a student on a project, and helped a student communicate with me about a change to his project. It was a series of text messages and a quick phone call that made the real difference today. Computers were down and others were having difficulty loading the desired browser. The browser issue was one I was immediately familiar with and knew how to solve. I called the sub and walked her through the quick steps, and voila, it worked! Things were back in business. Here I am over 2700 miles away, I had already spent the day visiting classrooms and meeting teachers and as I stood at the end of a pier overlooking the Mobile Bay, I took a moment to mentally step aside from processing through the wonderful observations of the day and to help fix an issue in the technology lab. Google Classroom, email, phone...three tools that are a part of my Swiss Army Knife of Education that helped me function as a teacher without walls today. This after hearing about a teacher who virtually teaches a middle school class and discussing flipped classrooms with other teachers. 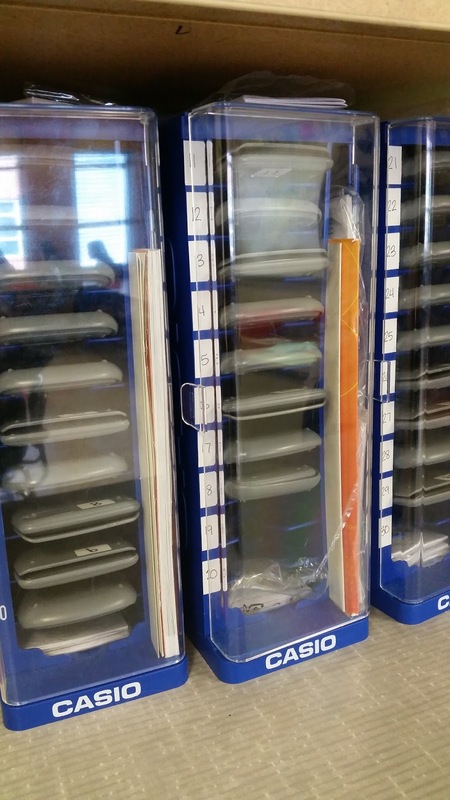 What tools help you remove the walls of your classroom and help you function as a teacher without walls? I have had a wonderful opportunity made available to me and supported by my administration. I was invited to observe Baldwin County Schools in Alabama. I worked with a teacher friend in the area to make arrangements on the Alabama end while my principal worked with me on my end to set up some of the logistics (such as when this trip could happen). After a few months of planning and preparation, the day arrived and I boarded a plane to get this show on the road...literally. Day One was set up for public school visits. Day two set up to visit an area Catholic School. Baldwin County uses iPads with their primary students and MacBooks with all others, starting in fifth grade. The MacBooks have cost the district over $9 million annually, according to a report from Channel 5 WKRG. The county school board will vote tomorrow night (Thursday, February 18) on to switch from the MacBooks to Chromebooks. According to the report and to local residents familiar with it, the switch will save the district around $7 million annually and will eliminate the $64 annual fee paid by families (per student) to cover insurance for the devices. It makes fiscal sense and the board seems set to make the change. You can see more on this here. Today, I had the opportunity to see second graders use iPads to conduct research and to record voice-overs for their frog projects. Using an app called SeeSaw, the second graders took a picture of the drawings and write-ups they created on the life cycle of a frog and they read the information to provide the voice over. Their teacher will listen to each one to check for quality and, if necessary, students will re-record. These will then be made available through the SeeSaw app and parents can take a look at their student's project. 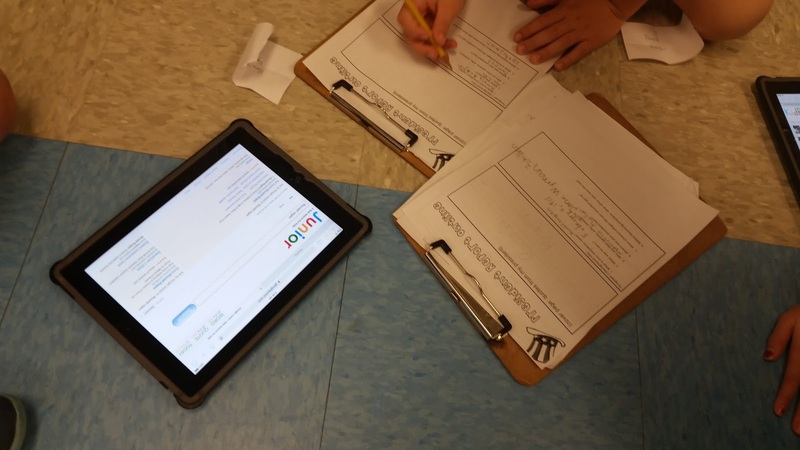 this class will use that app for several projects throughout the school year, much to their benefit, but it also helps their parents see what is happening in the classroom and have access to their student's work. Later, we visited a math class that had a low-tech day. 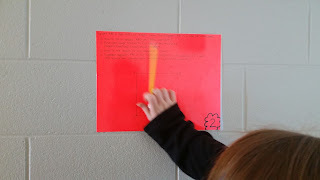 Students had the opportunity to get out into the hallway for a "Gallery Walk," the theme of which was the Pythagorean Theorem. Students worked in pairs carrying a paper, sectioned for each problem they would have to solve and a calculator. 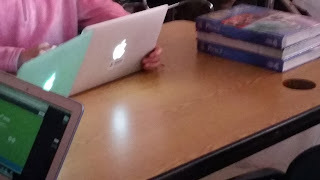 The teacher made her MacBook available if students needed to do a quick Google search to check their procedure, but they could also ask her for some guidance if necessary. The students worked through the math problems and checked their work, one-by-one. The teacher is trying to use more low-tech days rather than continuing to use the technology just to use the technology. She hopes to help the students see that they can do things without heavy reliance on technology. Her classroom is full of creative signs of learning, beginning at the doorway with student-created boxes. This hands-on approach with blending the use of technology seems to have students engaged in learning. The day ended on an incredible high note for me with a visit to a 21st Century Skills class. The atmosphere of the room can be sensed as you reach the doorway. Inside, the room includes three high tables, a couple of shorter tables, desks, comfortable chairs, soft lighting, music, and the smell of lavender. Students are busy at work on designing houses. Some students have opted to design their houses in Minecraft. All students are hard at work as the room exudes a sense of calm diligence. This room is a haven of creativity. This is the direction I am attempting to take the Technology Lab and Makserspace now known as the Fan Force Tech Lab. Here I am, 2700 miles away and getting great ideas and seeing that my hopes and goals for our creative space can happen. 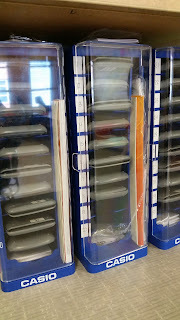 Other highlights from the day included seeing a science teacher's creation of ionic bond tabs for use with her interactive whiteboard, the engagement provided by a Kahoot quiz in another middle school science class, chatting with eighth graders about the upcoming shift from MacBooks to Chromebooks, and spending the day processing all of it with a fabulous educator. The students in Baldwin County are seeing how to use technology effectively and they have the opportunity to learn multiple platforms as well as a variety of tools. When I first arrived in Baldwin County last night, I ended up having a conversation with someone who asked me some questions about the dependence on technology. I shared with him my Swiss Army Knife analogy and talked about how it is not a dependence on technology, but a healthy incorporation of different types of technology that benefits our students. I had a similar conversation with a couple of teachers today. Just about any teacher working carefully to incorporate technology effectively will tell you that we need to avoid "technology to technology's sake" and we need to find the tools that work for our students. Today that meant an iPad app called SeeSaw for second graders, a calculator for eighth grade math students, and Minecraft for other eighth graders. Today, my visits included Daphne East Elementary, Fairhope Middle School, and Daphne Middle School. I am so thankful for this opportunity and for the chance to see why these teachers #believeinbaldwin and to see the various ways they are choosing to incorporate technology into their instruction and student output. Continue to follow me on this #edtechroadtrip as tomorrow I spend a second day seeing the approach a Baldwin County Catholic school has taken to incorporating technology. I walked into the first grade class with a plan in mind. I stuck to it. 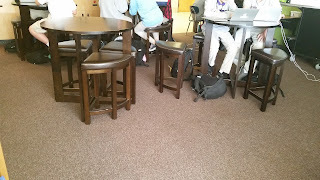 Then, with about 15 minutes of Chromebook time to go, one of the students raises her hand and says, "Ms. R!" She proceeds to ask me if she can "do" Kodable. "Let's take a look." And, so, we did. She didn't have the login information that she uses at home, so she went on to do something else for the last few minutes of the time. This time had, of course, been designated for "free choose." This is the time most students find activities on abcya.com but one or two may return to the exercises they love on code.org. This young student was disappointed that she was unable to do the Kodable activities, but took it in stride. "We'll have it set to go tomorrow," I said. So, I checked things out and set things up. The next day, I introduced kodable.com to a couple of first graders and unveiled it with the entire third grade class. 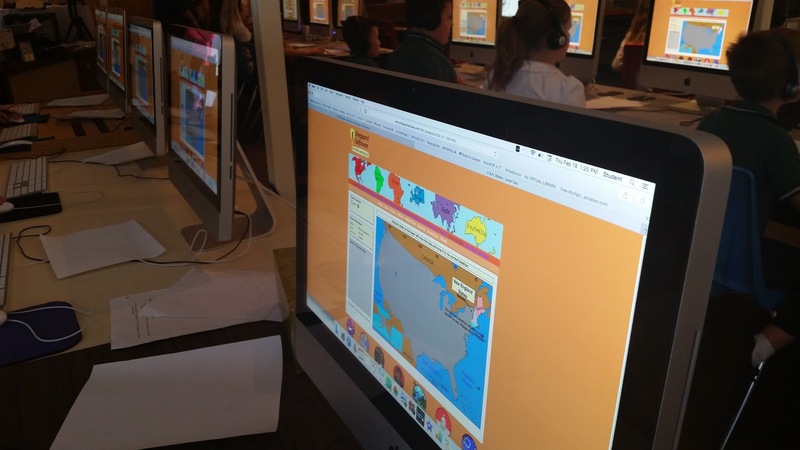 I have students developing math skills, reading skills, and learning to code...all in one! Finding another resource for this has been awesome. We may be a little late to the party, but party we will as education wins! Students win! It has its hiccups at times, as we have experienced with other programs. But, we navigate through them and the learning continues. The best part of this past week is that I learned something. A student introduced me to something that would ultimately benefit other students...whole classes even. As teachers, we need to take time to step back and listen to our students. We can learn things from them that will not only help them in their continuing educational journey but will extend to their classmates and schoolmates. We can grow excellence in our schools by simply taking a few moments to stop and listen to our students. What have you learned from taking a moment to listen to your students? How has it benefited your other students and the school?